Watch out, Apple: Carl Icahn is coming for you. Activist investor Icahn said Tuesday that he has taken a "large" stake in Apple, and he is pushing the company to use its cash to reward shareholders. 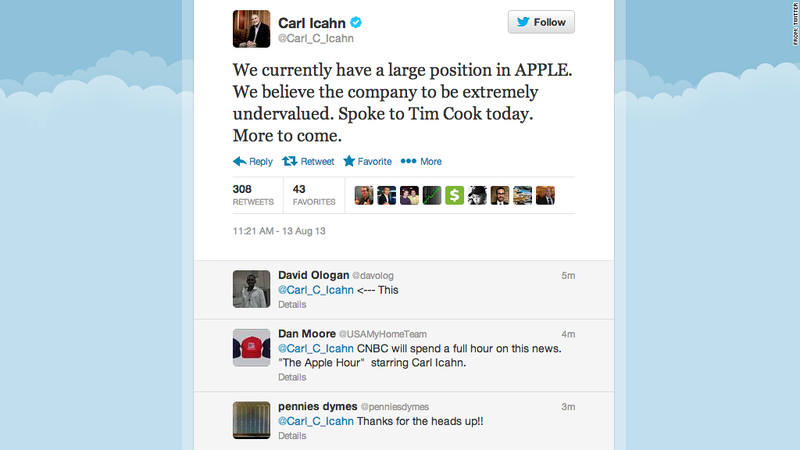 In a pair of tweets, Icahn said Apple is "extremely undervalued." Icahn had warned followers to watch his Twitter feed earlier in the week. Apple (AAPL) shares jumped on the news to close nearly 5% higher, at $489.57 per share -- a six-month high. Icahn's tweet added nearly $12.5 billion to Apple's market cap in just 100 minutes. Icahn also tweeted that he met with Apple CEO Tim Cook on Tuesday to push for a larger stock buyback, and he said the two plan to talk again soon. Apple issued a short, vague statement: "We appreciate the interest and investment of all our shareholders. Tim had a very positive conversation with Mr. Icahn today." Apple did not comment on the exact size of Icahn's stake, and no regulatory documents disclosing the purchase had yet been filed. The Securities and Exchange Commission requires institutional investment managers like Icahn to disclose holdings within 45 days of the end of a calendar quarter. The most recent quarter ended June 30, so Icahn would have to file this week. Icahn is only the latest investor to push Apple for a stock buyback. In February, David Einhorn of Greenlight Capital publicly slammed the company for "hoarding" billions in cash. Three months later, Apple announced it will return $100 billion to shareholders over the next three years, through a combination of stock buybacks and a quarterly dividend of $3.05 per share. A mollified Einhorn promptly increased his Apple stake. Icahn thinks Apple could still do better. As of the end of last quarter, Apple had an impressive $147 billion in cash on hand. Meanwhile, Icahn has also been embroiled in a lawsuit against Dell (DELL) to keep the company public, while founder Michael Dell is trying to take the struggling PC maker private. Icahn has made a name for himself by buying up shares -- and influence -- at dozens of companies. He executed a hostile takeover of the airline TWA in 1985, tried and failed to win a board seat at Motorola, pushed BEA Systems to sell to Oracle (ORCL), attempted to take over Lionsgate (LGF), and advocated for CNNMoney parent Time Warner (TWX)to break into four companies. Icahn took a 10% stake in Netflix (NFLX) last year. Earlier this year, he bought a 9% stake in Nuance Communications (NUAN), which powers Apple's Siri voice assistant.